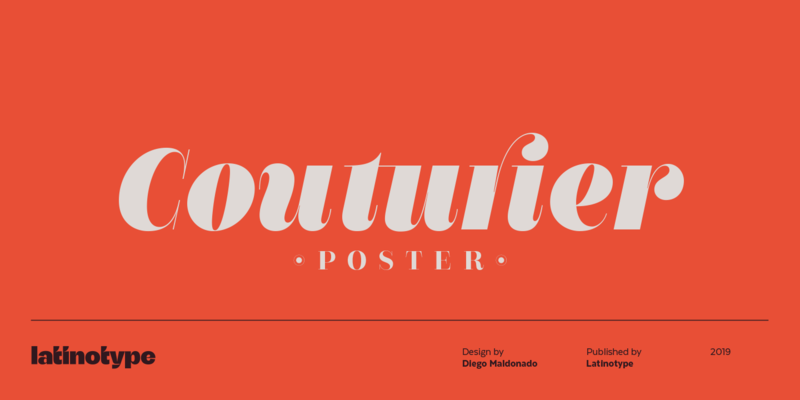 Couturier Poster is an elegant typeface created by Diego Maldonado and published by Latinotype. As the name suggests it, this typeface is characterized by high-contrast elegant lines, crafted to look simple and stylish. Mixing elegance and readability, Couturier Poster is a modern font with a minimal design, which shows its originality in large sizes. With an ultra-contemporary appearance creating a distinct high-impact, it provides a large collection of typographic resources (swashes, ligatures, small caps and alternates), that suit any whimsical mood. It includes six weights, from thin to black, plus a set of 1248 characters that cover 200 languages. When combined with Couturier or Couturier Poster, it creates a twist of detail that makes this font incredibly playful. A font description published on Wednesday, March 20th, 2019 in Diego Maldonado, Fonts, Latinotype by Iulia that has 667 views.